Providing you the best range of pv surge protection devices, photovoltaic surge absorber, solar surge protection suppressor, solar lightning protection system, solar lightning surge protector and solar surge protection device with effective & timely delivery. Solar/PV Surge Protectors are designed to protect Solar PV System harmful transients/ surges generated due to exposure of these applications and its interconnection back to the AC utility grid. Greater surface area of the solar PV array introduces more exposure to direct and/or induced lightning surges. 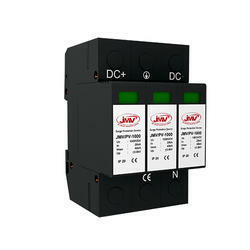 A photovoltaic surge protection device eliminates these potential threats and increases the systems life expectancy. We are a renowned organization, which is engaged in offering Photovoltaic Surge Absorber to our clients. JMV is a manufacturer of world class PV Surge Suppressor that ensures safety against the damaging effects of transient surges/ voltage spikes. JMV/3/PV are directly involved with our Photovoltaic electrical systems to provide a discharge path to the surges or over-voltages and to safeguard solar cells, Solar Module & Inverters DC Side. In order to append and respond to the diverse requirements of esteemed clients, we are able to offer Solar Cell Protection Circuit. The offered range of solar cell protection circuits is known for possessing short circuit rating and a patented thermal disconnected design. Along with this, the offered range is extensively applicable for its efficient charging methods. 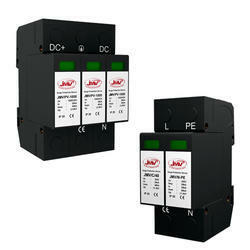 We are a renowned organization, which is engaged in offering Solar Surge Protector to our clients. The offered range of solar lightning surge protectors is available in customized designs, shapes and sizes to append and respond to the diverse demands of respectable clients. Along with this, the offered range of solar lightning surge protectors is designed utilizing high grade raw material and modern techniques in conformation with the highest quality norms and standards. Keeping the ever changing needs of our clients in minds, we bring forth a variety of data line transient protection that gives better performance and efficiency. These are availed in the national markets at the competitive prices. Looking for Solar Surge Protector ?